Where is he through the unfairness, inequity, and cruelness in the world? Where is he now? 'Eloi, Eloi, lama sabachthani?' That's what Jesus said on the cross before he died. 'My God, my God, why have you forsaken me?' Job asked the question too. But he kept the faith. And what did he get for it? Replacement children. PTSD. Was it worth it to have been a faithful servant? Or would it have been better to just curse God's name from the beginning? Where was God throughout all of Job's suffering and pain? He was winning a bet with Satan. Makes you wonder where he is through all of the unfairness, inequity, and cruelness in the world. Where is he now? 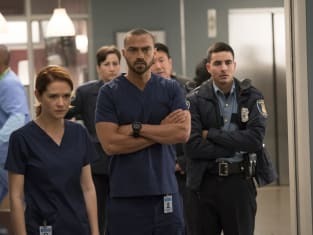 Grey's Anatomy Season 14 Episode 10: "Personal Jesus"
Permalink: Where is he through the unfairness, inequity, and cruelness in the world? Where is he now? I feel like I'm pooping out a cantaloupe. Permalink: I feel like I'm pooping out a cantaloupe. Grey's Anatomy Round Table: Let's Talk About "The Talk"!